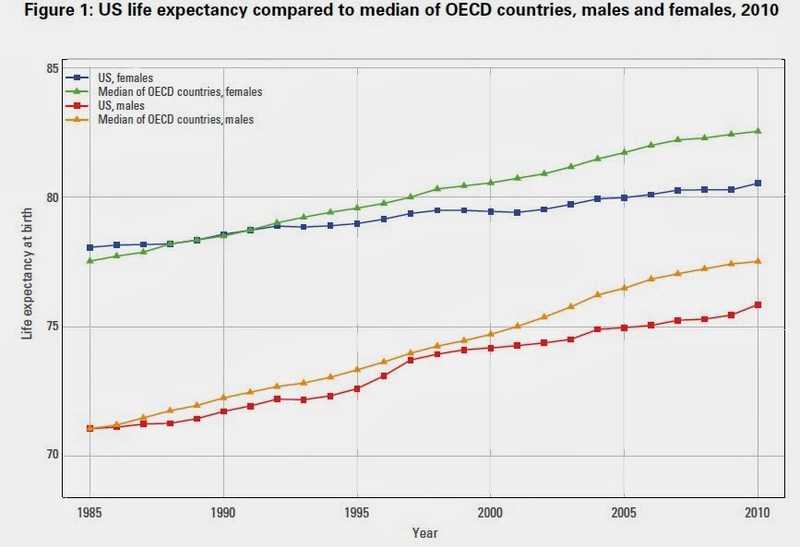 It's fairly well-known that life expectancy for Americans are below other high-income countries. But did you know that that the gap is getting worse? And how the underlying causes of death in the U.S., together with proximate factors behind those causes, have been evolving? The Institute for Health Metrics and Evaluation at the University of Washington takes up these issues and more in "The State of US Health: Innovations, Insights, and Recommendations from the Global Burden of Disease Study." Let's start with some international comparisons. Life expectancy in the US is rising--but it is rising more slowly than life expectancy in other OECD countries. Or consider the average of death. 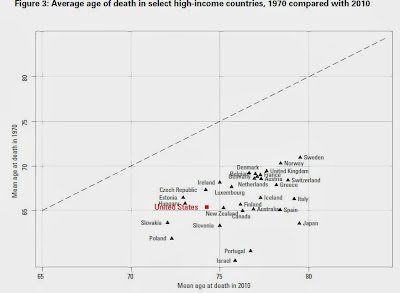 In the U.S., the average age of death rose by nine yeas from 1970 to 2010, but it has risen faster most other places. In this figure, the vertical axis shows age at death in 1970, so if you look at countries from top to bottom, you see how they were ranked by life expectancy in 1970. 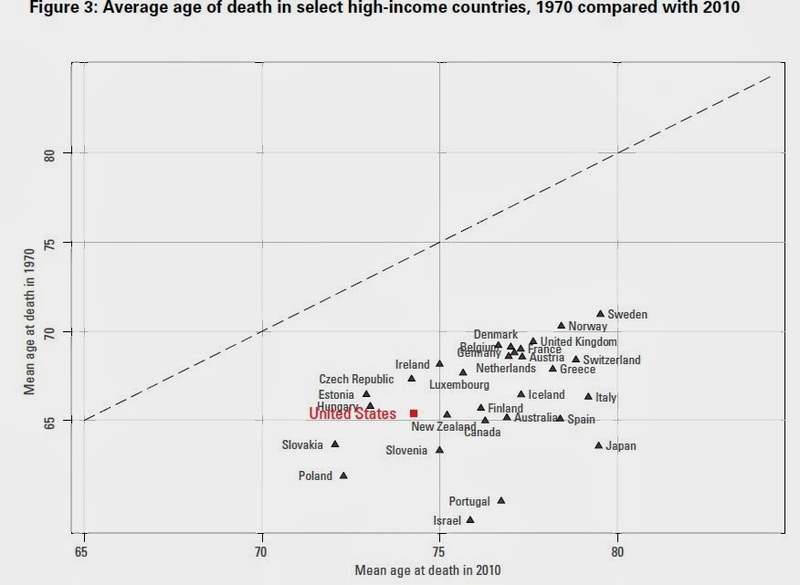 The horizontal axis shows age at death in 2010, so if you look at countries from right to left, you see how they are ranked by life expectancy in 2010. 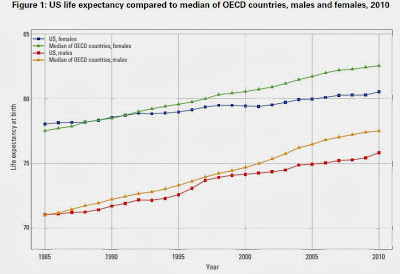 Countries at about the same horizontal level as the US like New Zealand, Canada, Australia, Spain, Italy, and Japan all had similar life expectancy to the U.S. in 1970, but are now out to the right of the US with higher life expectancies in 2010. What are the causes of early death? 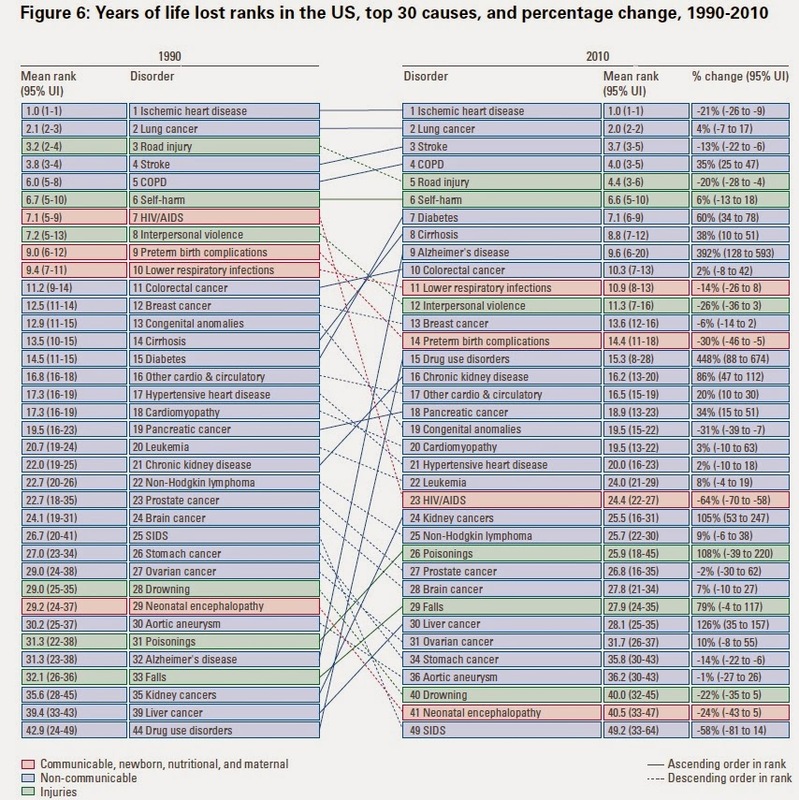 This study seeks to rank different causes of death according to "years of life lost"--that is, a cause of death that affects people at younger ages is counted more heavily than a cause of death which affects people at older ages. Here's the comparison from 1990 to 2010. 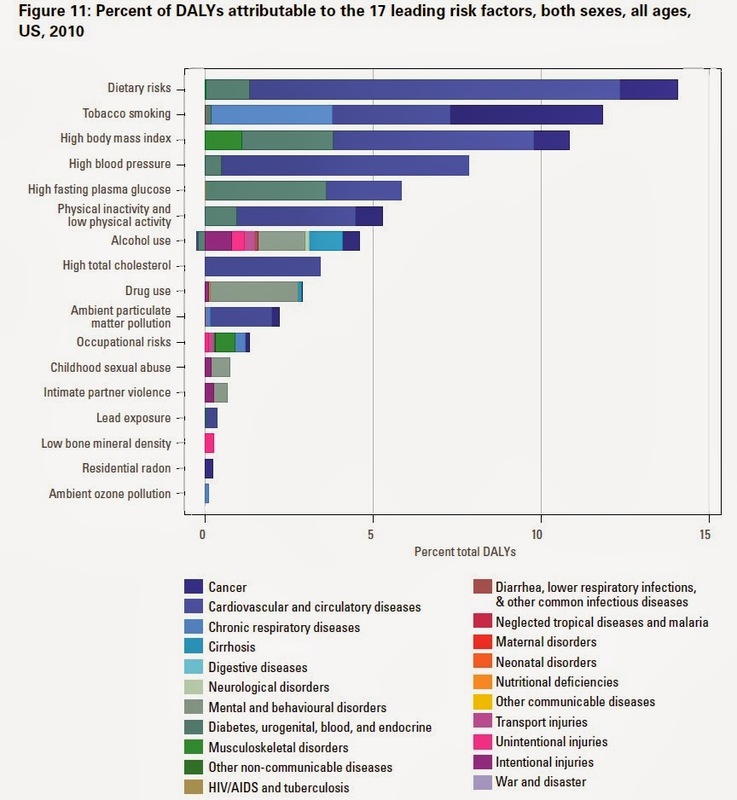 Notice that the top six causes of years of life lost change their order a bit, but are otherwise unchanged: heart disease, lung cancer, stroke, chronic obstructive pulmonary disease (COPD), road injury and self-harm. But after that, there are some dramatic changes. For example, the years of life lost because of HIV/AIDS, interpersonal violence, and pre-term birth complications are ranked lower. 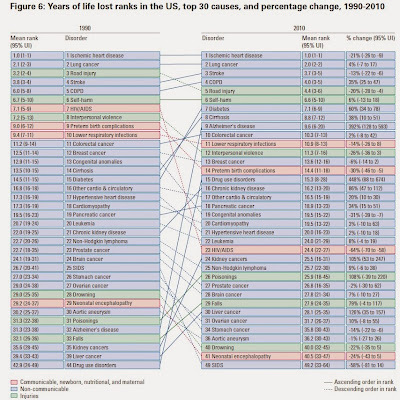 However, cirrhosis, diabetes, Alzheimer's disease, and drug use disorders now rank much higher. The study also looks at what is called a "disability-adjusted life year" or a DALY. This adds together years of life lost and also makes an adjustment for years lived with a disability. Looking at all the causes of death, the study calculates what percentage of the DALYs are attributable to various "risk factors." 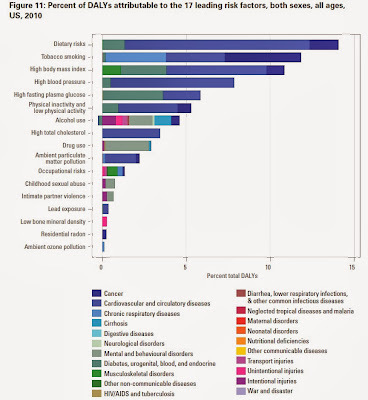 Clearly, the big risk factors are dietary risks (which largely seems to mean not eating enough fruits, nuts and seeds, vegetables, and whole grains, while eating too much salt and processed meat), together with tobacco use, obesity, high blood pressure, and low physical activity. Clearly, many of these issues of diet, weight, and exercise interact. The report also offers some county-level analysis across the US, with a reminder that "how health is experienced in the US varies greatly by locale. People who live in San Francisco or Fairfax County, Virginia, or Gunnison, Colorado, are enjoying some of the best life expectancies in the world. In some US counties, however, life expectancies are on par with countries in North Africa and Southeast Asia." As the US political system convulses over what legal standards that will govern health insurance, the mechanics of paying for health care are obviously of importance. But at the broad social level, life expectancy and health are first and foremost about diet, exercise, not smoking, not drinking to excess, and other behaviors.